Hayfield has announced the appointment of Jake Wilson as Brand Manager. Jake will be responsible for all aspects of graphic design and branding. He will also have a brief to drive consistency throughout the customer journey for the rapidly expanding Solihull-headquartered developer. 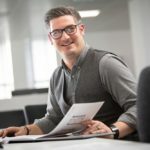 A graduate of The University of Winchester in 2010, Jake has close to a decade of marketing experience, half of which has been spent working for the housebuilding sector. Since 2014 he was a Graphic and Digital Designer for HD Marketing, an agency specialising in the housebuilding sector. Hayfield currently has six live sites in Warwickshire, Worcestershire and Oxfordshire. Approximately 200 luxury family homes will be delivered this year. Hayfield was recognised at the WhatHouse? Awards 2018 as one of the UK’s Best Small Housebuilders and has since been named a finalist in the 2019 Property Week RESI Awards. Kelly Sharman, Sales and Marketing Director, said: “With a number of Hayfield developments already flourishing and many more in planning, the time was right to recruit a dedicated Brand Manager to streamline the journey across each of our customer touchpoints.